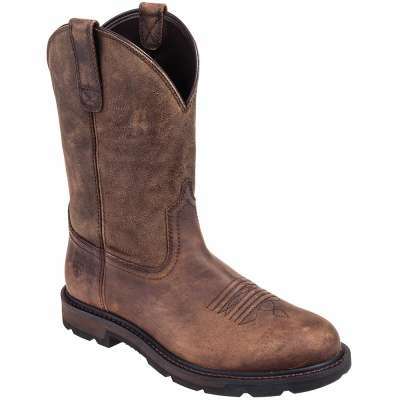 Get the most out of your work footwear with a pair of these Ariat 10014241 Brown Groundbreaker Pull-On Steel Toe EH Boots. 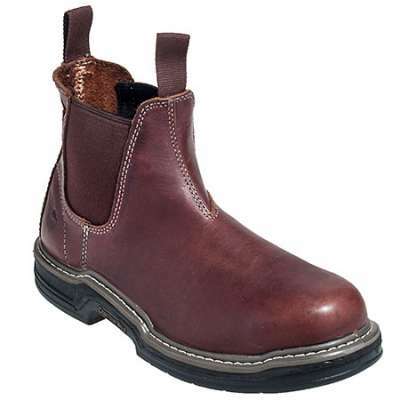 Crafted from full-grain leather, these Groundbreaker boots have shafts that are extremely durable and supportive. 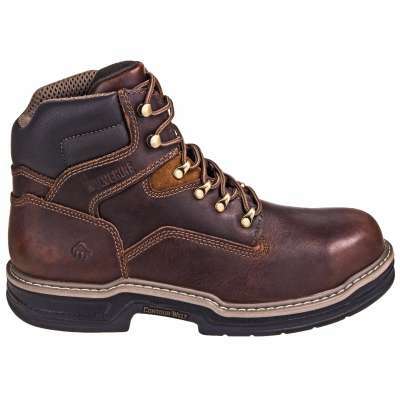 Used primarily in work boots designed for extended trips, heavy loads, and hard terrain, full-grain leather is extremely water-resistant. It can absorb up to 30% of its weight in water vapor without loss of dryness. 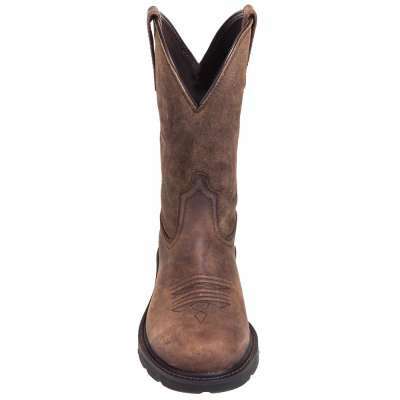 And since all-leather boots are less likely to change drastically in shape and flexibility over time, they’ll provide long-lasting comfort. 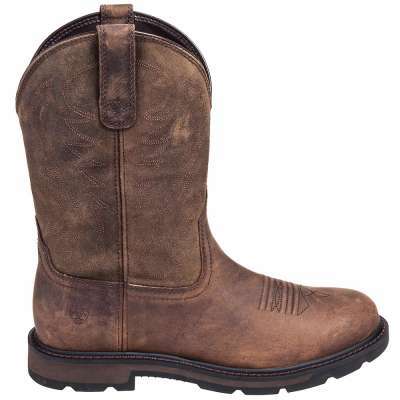 To provide all-day comfort and support, this pair of men’s boots feature Ariat’s 4LR comfort and stability system. This 4-Layer Rebound Technology features 4-layer footbeds with added cushion and rebound to provide superior comfort throughout the day. 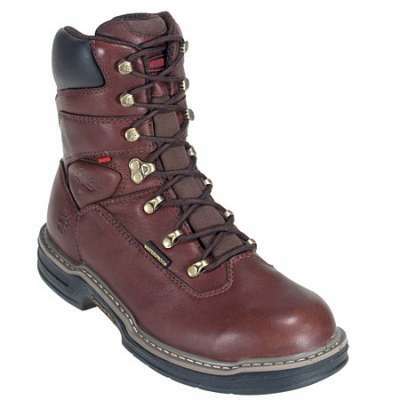 It also features lightweight shanks to enhance stability and relieve pressure off your feet. 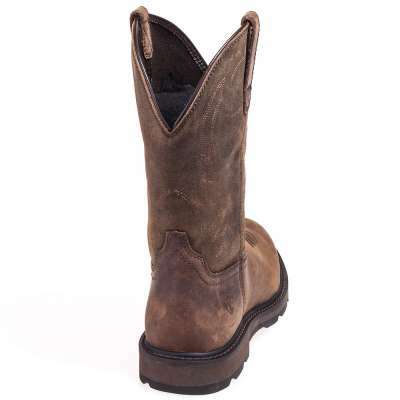 Heavy-duty oil- and slip-resistant Duratread outsoles on the bottoms of these safety toe boots provide maximum wear-resistance as well as flexibility. The exclusive rubber compound outlasts traditional rubber and is extremely flexible for ergonomic performance. ASTM F2413-11 I/75 C/75 EH safety standards. 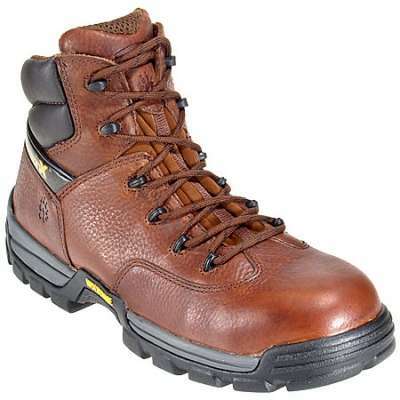 This steel toe footwear can endure up to 75 lbs. of impact and also 2500 pounds of compression. For extra protection, you’ll be provided with a secondary source of electric shock-resistance protection against incidental contact with electrical circuits of 14,000 volts or less. 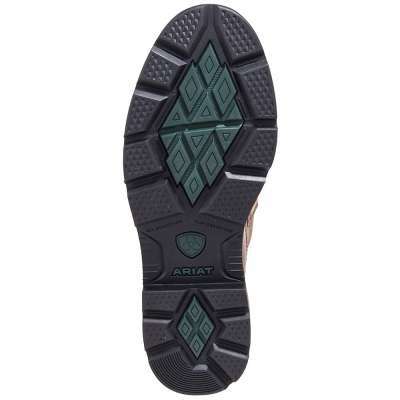 EH-rated footwear is manufactured with non-conductive electrical shock-resistant soles and also heels. This offers protection against accidental contact with live electrical circuits, electrically-energized conductors, parts, or apparatus under dry conditions.